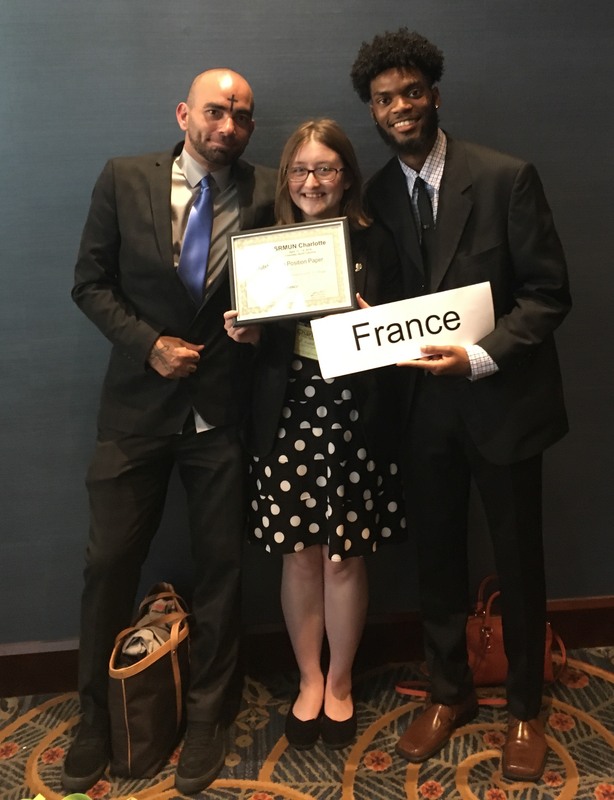 GTCC students Eduardo Oakley (left), Samantha Daley (center) and Tavin Felton-Stackhouse (right) represented France at the Southern Regional Model United Nations conference. They earned perfect scores on their position papers, a major achievement in the competition. JAMESTOWN, N.C.— Guilford Technical Community College’s Model United Nations Club recently competed in the Southern Regional Model United Nations (SRMUN) conference held April 12-14 in Charlotte, N.C. The GTCC delegation received an average score of 92 on their way to receiving the Outstanding Position Paper Award, the highest honor awarded for papers. Additionally, two GTCC delegate teams achieved perfect scores for their position papers. Tavin Felton-Stackhouse and Eduardo Oakley represented France in the General Assembly and earned a perfect score for their paper. They competed against delegates representing 77 countries. Samantha Daley and Eric Diaz also scored a 100 on their position paper while representing France on the United Nations Development Programme committee. It was a pinnacle achievement for the time and effort required to prepare for the conference. “The 100 on my paper was very nice. It was validation for all the hard work I’ve been doing,” said Samantha. Position papers are written by each member of the delegation and include research about their assigned country’s policy on certain agenda topics and solutions to those issues. The papers received individual scores by the conference chairs and are evaluated for writing style, format, tone, research and purpose. Daley, who graduates in May and will continue her education at the University of North Carolina at Chapel Hill, also served as the club’s president. She organized and led all the club meetings, edited position papers prior to submission and attended head delegate meetings while at the SRMUN conference. GTCC competed against 41 other colleges and universities including Clemson University, East Carolina University, the University of North Carolina at Greensboro and the College of Charleston. More than 500 delegates attended the conference. GTCC students Yusra Nasri, Chris Stum, Andrew Thompson, Jade Marrero, Holt Hall, Joey Brannon, Corban Hunt, Kevin Kareis, Edwin Rosales, Benny Miramontes, Charles Sartore, Eve McBride, Lily Clark and Rob Walsh also participated in the conference. The GTCC Model United Nations Club competes in two major conferences during the academic year.